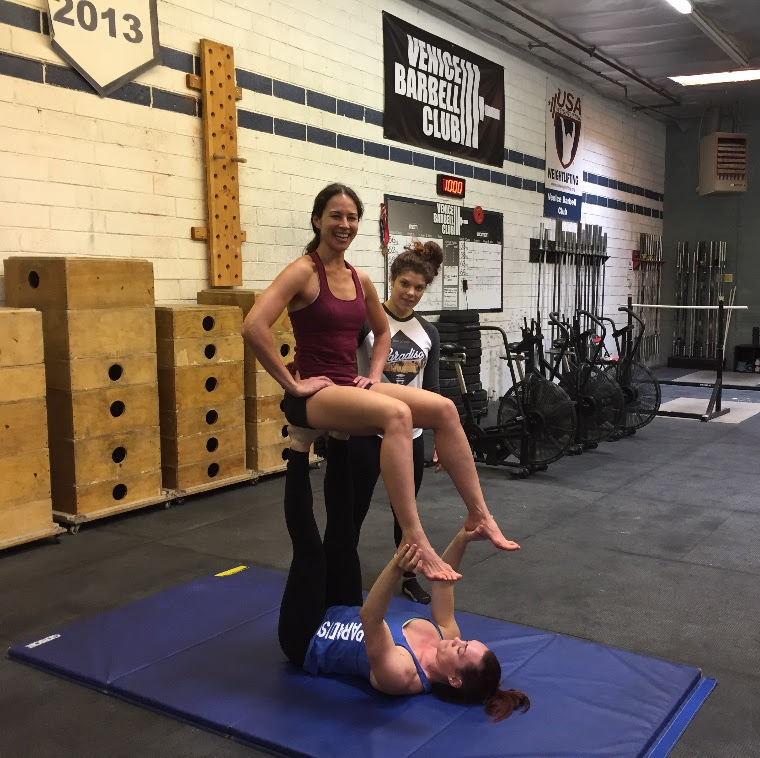 Home » WOD Blog » AcroYoga is Back! AcroYoga classes are back beginning in May! Classes will be held every Wednesday at 8pm in Venice and 12 noon Thursday at Venice. There will not be noon group class on Thursday. This weekly class will dive into the unique world of AcroYoga! Come explore the dynamics of flying/basing/spotting trios and partner movement as you cultivate trust, strength, and flexibility, in a fun-filled safe atmosphere. Basic poses and transitions will be broken down step-by-step providing a class series that is perfect for those brand new to AcroYoga! Each week, Elizabeth Burris will offer a new AcroYoga skill along with warm-ups, appropriate partner calibrations and conditioning drills. The class will be taught by Elizabeth Burris. Elizabeth is a certified Yoga & AcroYoga Level 2 teacher, and AYFit Trainer. She has 14 years of studying yoga from Vinyasa to Ashtanga, and 7 years of practicing AcroYoga. She has had the privilege of being a White House Yoga Ambassador, taught workshops for Reebok and Lululemon, lead classes at Divine Play, the largest AcroYoga festival in the world, and holds retreats world-wide. As an instructor, Elizabeth focuses on community building and strives to hold space for others to shine. She has a zest for life and believes that AcroYoga brings the playful kid out of everyone. Her classes are described as fun, challenging, dynamic, and offer solid foundational skills, new tricks and creative transitions, and refinements for the experienced or brand newbie.